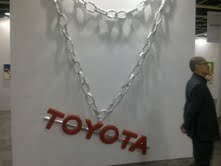 IP Dragon 知識產權龍: Toyota on a Chain: Creatively Challenged Art or Parody? What about for social commentary or other form of critical expression? In the US at least it is not uncommon to see people wearing gold-plated pendants made up of luxury car marques - Cadillac and Mercedes in particular. So creating a pendent using a more mass-market brand is making a statement (however bland it might be). I see you point, but it seems to me arbitrary to single out one brand, in this case Toyota. I think one can only single out one brand if the social critique is aimed at that brand's conduct to increase its accountability. However, this is only fair if the brand can let a court judge whether this critique is legitimate and not a defamation. Many times a brand is singled out and just used as a symbol because it is famous, even though there is no direct link between a critique and the brand. It is too easy to damage a brand, and some artists are just free-riding on investments made by a brand.